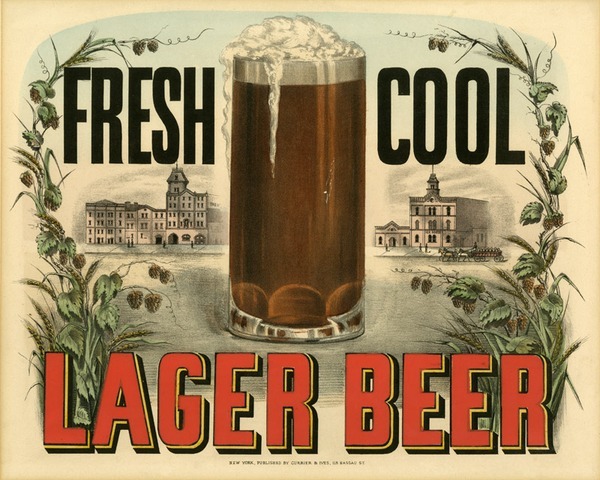 NEW YORK, NY - The fascinating yet largely unknown legacy of the cultural history of beer in New York is uncovered in Beer Here: Brewing New York's History at the New-York Historical Society. The exhibition traces 350 years of the production and consumption of beer in the city--from colonial New York, when beer was a vital source of nourishment and tax revenues, to the current artisanal revolution occurring in microbreweries throughout the state. This exhibition is on view at New-York Historical through September 2, 2012. Beer has been brewed in New York City since the days of its earliest European settlement. Beer Here: Brewing New York's History will begin with an exploration of the colonial period in New York when beer was often safer to drink than water, and noted citizens brewed beer as just one aspect of their business activities. It will then take the visitor up to the present popularity of microbreweries and homebrewing. Topics include the nutritional properties of colonial beer and early New York brewers in the age of revolution; infrastructure innovations and the importance of access to clean water; large-scale brewing in nineteenth-century New York and the influence of immigration; temperance movements and the impact of prohibition; bottling, canning, refrigeration and other technological advances; and the promotional efforts of the City's breweries in the age of mass production. These topics will be highlighted through a display of historical objects and documents such as a 1779 account book from a New York City brewer who sold beer to both the British and patriot sides; sections of early nineteenth-century wooden pipes from one of the city's first water systems; a bronze medal that commemorates an 1855 New York State temperance law; beer trays from a variety of late nineteenth-century brewers; souvenirs from the campaign to repeal prohibition; and a selection of advertisements from Piels, Rheingold and Schaefer, beloved hometown brewers. The exhibit will conclude with a small beer hall that features a selection of favorite New York City and State artisanal beers. "Beer is an important cultural influencer," explained Debra Schmidt Bach and Nina Nazionale, curators of Beer Here: Brewing New York's History, "and is not a topic typically covered in an exhibition at an Historical Society. We were intrigued by the longevity and popularity of beer in New York throughout the past 300 years, and wanted to bring together objects and documents of historical and cultural importance to investigate this venerable tradition." New-York Historical will host a special summer public program, "Beer Appreciation: The History and Renaissance of Beer," featuring experts Garrett Oliver and Steve Hindy from Brooklyn Brewery, at which local craft beers will be served on Tuesday, July 10, 6:30 pm. Beer Here: Brewing New York's History curators Debra Schmidt Bach and Nina Nazionale will join the conversation. Beer Here: Brewing New York's History is organized with support from both Brooklyn Brewery and Heartland Brewery. The New-York Historical Society, one of America's pre-eminent cultural institutions, is dedicated to fostering research and presenting art and history exhibitions and public programs that reveal the dynamism of history and its influence on the world of today. Founded in 1804, New-York Historical has a mission to explore the richly layered history of New York City and State and the country, and to serve as a national forum for the discussion of issues surrounding the making and meaning of history. New-York Historical is recognized for engaging the public with deeply researched and far-ranging exhibitions, such as Alexander Hamilton: The Man Who Made Modern America; Slavery in New York; Nature and the American Vision: The Hudson River School at the New-York Historical Society; Grant and Lee in War and Peace; Lincoln and New York; The Grateful Dead: Now Playing at the New-York Historical Society; and Nueva York. Supporting these exhibitions and related education programs is one of the world's greatest collections of historical artifacts, works of American art, and other materials documenting the history of the United States and New York. - I received the press release above from the New York Historical Society. Sounds like a cool exhibit. This page contains a single entry by Brewmaster published on February 16, 2012 10:56 PM. Three Floyds - Dark Lord 2009 was the previous entry in this blog. The Abyss - Deschutes 2010 is the next entry in this blog.